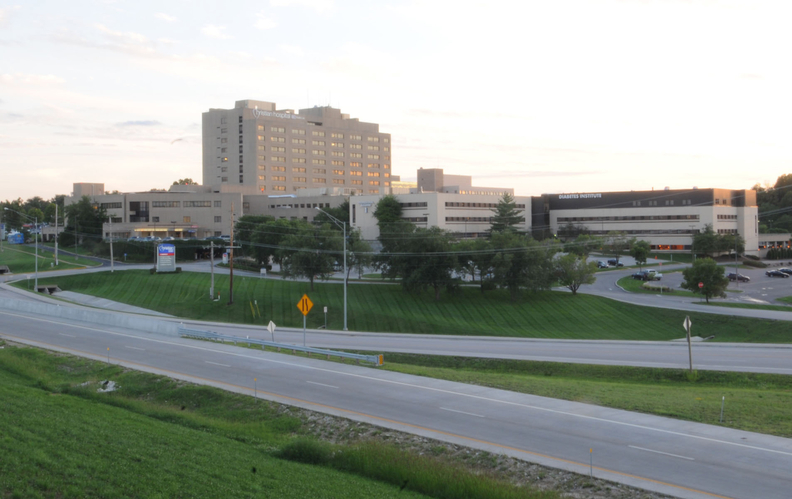 BJC HealthCare's Christian Hospital would have lost just $140,000 instead of $600,000 because of readmissions if Medicare accounted for socio-economic status, according to an analysis commissioned by the state hospital association. Christian Hospital says a costly difference of opinion with Medicare hinges on how to count the large number of poor people that the St. Louis hospital treats. Steven Lipstein, CEO of BJC, which includes Barnes-Jewish hospital in St. Louis, said Medicare doesn't play fair because its formula for setting penalties does not factor in patients with socio-economic disadvantages—low-income, poor health habits and chronic illnesses, for instance—that contribute to repeated hospitalizations. If Medicare did that, the hospital's penalty would have been $140,000, Lipstein said. As every healthcare executive knows, half a million dollars pays for “a whole lot of nurses,” he said. In total, hospitals around the country lost $420 million last year under Medicare's Hospital Readmissions Reduction Program, an initiative of the federal health law that seeks to push hospitals to deliver better patient care. A study published in the journal Health Affairs in January found that socio-economic factors appear to drive some of the difference in readmission rates between safety net hospitals and their peers—but also that hospital performance may play a role. And, the authors concluded, the program's current method for determining excess readmissions “has already considerably narrowed” the gaps in readmission rates among hospitals. Hospitals, however, have lobbied Congress and Medicare to change the rules and gained some ground May 18 when Rep. Pat Tiberi (R-Ohio) introduced a bill in the House to adjust Medicare's program to account for socio-economic status. The bill was co-sponsored by Rep. Jim McDermott (D-Wash.). The House Ways and Means Committee has scheduled a May 24 meeting to discuss the bill. Meanwhile, the Missouri Hospital Association is trying to get public opinion behind it. Experts are still studying the issue, but hospitals say Medicare must tweak how excess readmissions are measured to make sure penalties reflect quality, not demographics. This year, the association overhauled its consumer website, Focus on Hospitals, to include not only the federal readmissions data, but also each member's readmissions statistics, adjusted for patients' Medicaid status and neighborhood poverty rates. The federal government already adjusts its readmissions data for age, medical history and other diseases or conditions, and that information is public on Medicare's Hospital Compare website. The association explained its adjustment methodology in an article on the site. “There is emerging national research that suggest poverty and other community factors increase the likelihood a patient will have an unplanned admission to the hospital within 30 days of discharge,” it stated. The hospital group's alternative data—Lipstein's source for how Christian could have reduced its 2015 penalty—comes from a study it commissioned. One finding: Missouri hospitals' readmissions rates improved between 43% to 88% when patients' poverty levels were considered. “The question is, has (readjustment) been done in a just and fair way,” Lipstein said. The Missouri Hospital Association “has provided methodology that suggests what the feds are doing is unfair,” he said. 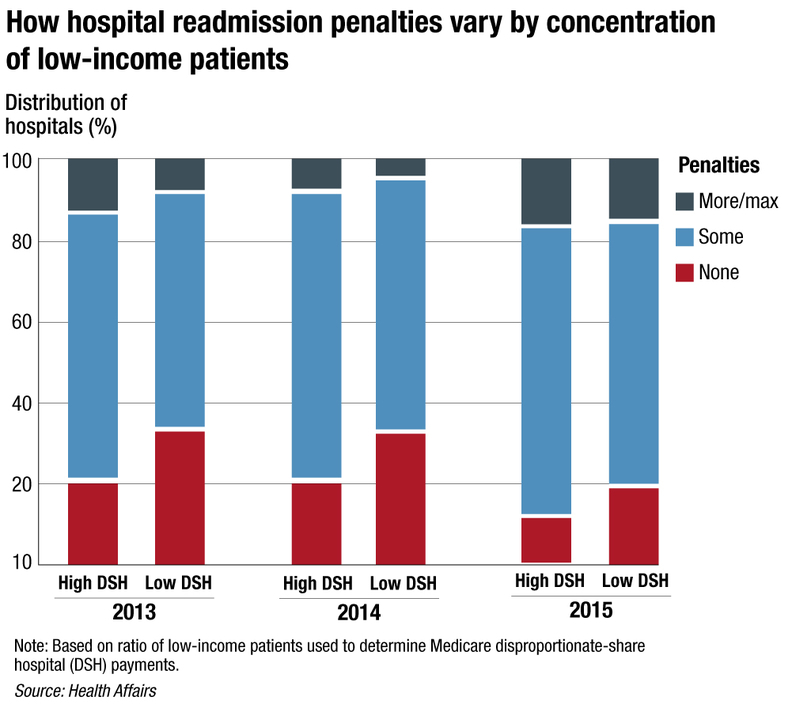 The controversy over penalties is likely to grow beyond the readmissions question. Federal health officials have announced that they want to shift away from paying doctors and hospitals based on the services they provide and move toward a value-based system that encourages better quality of care and better outcomes while controlling costs. Medicare bases readmission penalties on the care of Medicare patients who were originally hospitalized for one of five conditions: heart attack, heart failure, pneumonia, chronic lung problems, and elective hip or knee replacements. “The question is, has (readjustment) been done in a just and fair way? The Missouri Hospital Association has provided methodology that suggests what the feds are doing is unfair,” CEO of BJC HealthCare Steven Lipstein said. This year, Medicare penalized almost half of all hospitals—2,592 to be exact—for excessive readmissions. More than 500 are being fined 1% of their Medicare payments or more for the fiscal year that ends Sept. 30. Still, the system harms so-called safety net hospitals most, said Herb Kuhn, the Missouri Hospital Association's CEO. “Hospitals in difficult neighborhoods are getting worse scores, and those in affluent (ones) are getting better (ones). It's time to adjust (rates) for the disease of poverty,” he said. 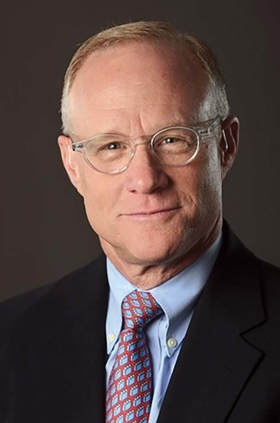 Kuhn's experience makes him an influential voice on health policy issues. He was CMS deputy administrator from 2006 to 2009 and before that, director of the agency's Center for Medicare Management. In April, Kuhn completed a three-year term on the Medicare Payment Advisory Commission, which advises Congress. That commission proposed an alternative to Medicare's readmission penalties last year. Others are also studying modifications. The CMS has taken a cautious stance. But last year, the agency announced it is working with the National Quality Forum, a not-for-profit group whose research influences the CMS' quality metrics, on a trial to test socio-economic risk adjustment. The legislation introduced last week calls for Medicare's readmissions program to compare hospitals with similar populations of patients eligible for both Medicare and Medicaid—known as dual-eligible beneficiaries—when calculating its payment adjustments. That would be in effect until HHS can revisit the metrics based on research Congress requested under a 2014 law. But Leah Binder, CEO of the Leapfrog Group, a not-for-profit patient-safety group, said Medicare's readmission penalties have pushed hospitals to improve care and that adjusting the data for patients' poverty levels could deter them. “Hospitals are paid a lot of money. I think they can find a way to handle their readmissions the way they should have been handling them all along,” Binder said.